The Locator/Identifier Separation Protocol (LISP) was designed several years ago by Dino Farinacci and his colleagues at Cisco Systems as an architecture to improve the scalability of the Internet routing system. Like several other such proposals, LISP proposed to separate the two usages of addresses. In contrast with many other proposals that were discussed in the IRTF Routing Research Group, LISP has been fully implemented at tested on the global Internet through the lisp4.net testbed. Several implementations of LISP exist on different types of Cisco routers and there is also the OpenLISP open-source implementation on FreeBSD . locators. These addresses are used to identify routers inside the network. The locators are advertised in the routing system. identifier addresses are used to identify endhosts. These addresses are not distributed in the routing system. This is the main advantage of LISP from a scalability viewpoint. A typical deployment of LISP in the global Internet is described in the figure below . Endhosts are assigned identifiers. Identifiers are IP addresses (IPv4 or IPv6) whose reachability is advertised by the intradomain routing protocol inside the enterprise network. Two hosts that belong to the same network can exchange packets directly (A->B arrow in the above figure). Locators are assigned to border routers (ITRx and ETRx in the figure above). These locators are advertised in the global Internet routing system by using BGP. As the addresses of hosts A, B and C are not advertised by BGP, packets destined to these addresses cannot apear in the global Internet. LISP solves this problem by using map-and-encap. When A sends a packet towards C, it first sends a regular packet to its border router (ITR2 in the above figure). The border router performs two operations. First, it queries the LISP mapping system to retrieve the locator of the border routers that can reach the destination identifier C. Then, the original packet destined to C in encapsulated inside a LISP packet whose source is ITR2 and destination ETR1, one of the locators of identifier C. When ETR1 receives the encapsulated packet, it removes the first IP header and forwards as a regular IP packet towards its destination. The mapping system plays an important role in the performance and the stability of a LISP-based network since border routers need to maintain a cache of the mappings that they use . The first releases of LISP used a hack that combined GRE tunnels and BGP to distribute mapping information . This solution had the advantage of being simple to implement (at least on Cisco routers) but we expected that it would become complex to operate and maintain in the long term. After many discussions and simulations, we convinced the LISP designers to opt for a different mapping system whose operation is inspired by the Domain Name System. Our LISP-TREE proposal  is the basis for the DDT mapping system that is now implemented and used by LISP routers. Simulation-based studies have shown that LISP can provide several important benefits compared to the classic Internet architecture . Some companies have used LISP to support specific services. For example, facebook has relied on LISP to support IPv6-based services . However, until now the deployment use cases were not completely convincing from a commercial viewpoint. A recent announcement could change the situation. In a whitepaper, Cisco describes how LISP can be combined with encryption techniques to support Virtual Private Network services. Given the importance of VPN services for enterprise networks, this could become a killer application for LISP. There are apparently already several networks using LISP to support VPN services. The future of LISP will be guaranteed once a second major router vendor decides to implement LISP. V. Fuller, D. Farinacci, D. Meyer, and D. Lewis. Lisp alternative topology (lisp+alt). Internet draft, draft-ietf-lisp-alt-10.txt, December 2011. Luigi Iannone and Olivier Bonaventure. On the cost of caching locator/ID mappings. In CoNEXT ‘07: Proceedings of the 2007 ACM CoNEXT conference. ACM, December 2007. Luigi Iannone, Damien Saucez, and Olivier Bonaventure. Implementing the Locator/ID Separation Protocol: Design and experience. Computer Networks: The International Journal of Computer and Telecommunications Networking, March 2011. Loránd Jakab, Albert Cabellos-Aparicio, Florin Coras, Damien Saucez, and Olivier Bonaventure. LISP-TREE: a DNS hierarchy to support the lisp mapping system. IEEE Journal on Selected Areas in Communications, October 2010. Bruno Quoitin, Luigi Iannone, Cédric de Launois, and Olivier Bonaventure. Evaluating the benefits of the locator/identifier separation. In MobiArch ‘07: Proceedings of 2nd ACM/IEEE international workshop on Mobility in the evolving internet architecture. ACM Request Permissions, August 2007. (1, 2, 3) Damien Saucez, Luigi Iannone, Olivier Bonaventure, and Dino Farinacci. 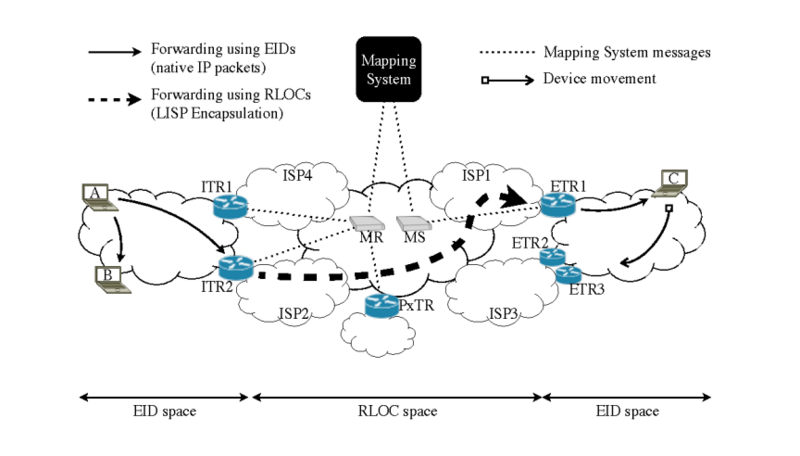 Designing a Deployable Internet: The Locator/Identifier Separation Protocol. IEEE Internet Computing Magazine, 16(6):14–21, 2012.